When designing a laboratory, different stakeholder groups hold differing views. Not to mention, many individuals hold various opinions that have opposing priorities. But once decisions have been made and there is a consensus among the users, designing a lab is an exciting process. A successful lab design layout will promote the use of laboratory space while ensuring safe working conditions for laboratory personnel. Whether you find yourself in an animal research lab, a quality-control lab, or a forensics lab, every lab is different. But their design, when done right, will strive to optimize workflow, cooperation, and productivity. • Avoid placing fume hoods near doorways or exits. Should a chemical release occur or a fire begins in the fume hood, the exit would be blocked. The National Fire Protection Association recommends that any fume hood is ten feet from any door or exit. Additionally, constant traffic going in and out of the laboratory and immediately by the fume hood can affect its performance. As people walk by a fume hood the air currents caused by foot traffic can affect the ability of the hood to capture and exhaust contaminants. • Locate fume hoods away from windows or air diffusers. Any area that produces air currents can affect the ability of the hood to capture and exhaust contaminants. By design windows, air diffusers, and the aforementioned doorways, all have varying types of air currents that would affect fume hood performance. • Do not locate fume hoods opposite areas where personnel spend significant time. For the reasons mentioned above, any explosive incident inside the hood could injure anyone nearby. Workstations, desks, or microscope benches are all common areas where personnel gather and placing them right next to a fume hood poses a safety risk. •Place emergency wash stations within a few seconds from each fume hood. Personnel are often exposed to corrosive, flammable, or toxic substances while working inside a fume hood. Having an emergency eyewash or safety shower within ten seconds of travel time to a fume hood is a good practice. Planning and designing a laboratory takes time and diligence to ensure it is optimized. It takes even more time to ensure all components are adequately accommodated, and a fume hood is just one of many components that must be considered when designing a laboratory. Designers must understand the changing mechanical and electrical requirements of each laboratory space. They must also incorporate the design principles related to the efficient operation of laboratory equipment. 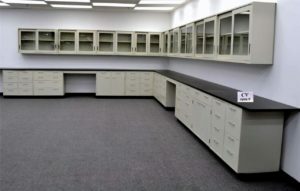 National Laboratory Sales creates custom configurations for any laboratory. With hundreds of fume hoods and laboratory cabinets to choose from, we specialize in the design of laboratory configurations. Call us today to learn about how our innovative solutions will benefit your laboratory. 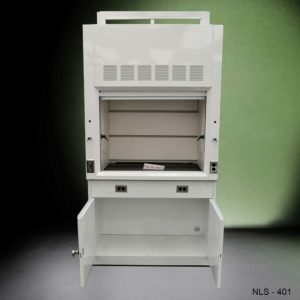 Fume Hoods and Biosafety Equipment: What is the difference?